It depends on the type. Doctors divide lung cancer into 2 primary types, Non Small Cell and Small Cell. It is important to understand the type of lung cancer you have to understand what treatments will be offered. You will undergo a biopsy of the suspected lung tumor and a doctor trained to look at the tissue under the microscope (Pathologist) will issue a Pathology report stating which type of lung cancer you have. Many patients are frustrated when waiting for their “path reports” which can often take 3-5 days. It is important that the Pathologist have time to analyze the tissue and run the needed tests to issue a correct diagnosis. Lung cancer treatment is very complex and an incorrect pathology report could result in mistreatment. The next step will be obtaining a PET scan. Both types of lung cancers like to spread to lymph nodes and other organs. PET imaging typically provides accurate staging of lung cancer and will allow your oncology team to design an approach specific to your cancer. Unfortunately most lung cancers present at advanced stages (Stage III or Stage IV) meaning that the cancer has already traveled from the lung to the lymph nodes in the middle of the chest (called the mediastinum [Stage III]) or traveled via the blood stream to organs such as the liver, bones, or brain (Stage IV). The results of the pathology report and the PET scan results are 2 key pieces of information you need to discuss with your oncologist to understand treatment options. Attributed to smoking and prevalence has declined with the decrease in smoking in the US. The information below is my attempt at a general overview of NSCLC treatment. As discussed previously, the management of lung cancers can be quite complex and may differ then what is outlined below. You may be offered enrollment on a clinical trial or be considered for immunotherapy as part of your treatment course. Non-invasive treatment with radiation using a technique known as SBRT (stereotactic body radiation therapy). Typically patients can undergo 3-5 radiation treatments and avoid a hospital stay and painful surgery. Current studies show SBRT provides the same cure rates as surgery in appropriately selected patients*. *A bronchoscopy is done prior to SBRT to sample the lymph nodes to confirm there is no cancer that needs to be treated. Early Stage II Lung cancers (tumor is >5cm or there is concern for hilar lymph nodes with cancer). These tumors are typically treated with surgery with removal of a lobe of the lung and lymph nodes and then followed by chemotherapy. You will meet with a Medical Oncologist to discuss the types of chemotherapy appropriate for your cancer. Locally Advanced Lung Cancer (Stage III) (includes large tumors and involvement of the mediastinal lymph nodes in the center of the chest). These cancers are typically treated with chemo and radiation together for approximately 6 weeks. Stage IV Lung Cancer (the tumor has spread through the blood stream to other organs such as the bone, liver, or brain). You will have an individualized discussion with your oncology team regarding your goals of care. Historically, we have not been able to cure Stage IV lung cancer, however we can provide treatment and patients are living longer and longer. You will need some type of drug therapy to slow the progression of the cancer and possibly radiation to shrink any tumors that are causing problems (e.g. reduce pain from a tumor in the bone). Most importantly, you should request a consultation with a Palliative Care physician. Palliative Care doctors help treat the symptoms of cancer and will meet with you and your family to determine your needs. A study in the prestigious New England Journal of Medicine showed that ensure a patient had a Palliative Care doctor prolonged their life more than chemo or radiation. Small cell lung cancer spreads rapidly. Patients typically are diagnosed after it has spread to the lymph nodes (Stage III) or into the brain, liver, or bone (Stage IV). Consequently, Stage III treatment typically involves rapid initiation on chemotherapy. Chemotherapy is delivered into the bloodstream and will travel with the cancer cells, eradicating them and helping prevent further spread of the disease. Radiation will be added after initiation of chemotherapy with the goal of eradicating the lung tumor and any lymph nodes with cancer. Radiation can be delivered twice daily for three weeks or daily for 6 weeks. There is a clinical trial currently evaluating whether increasing the dose of radiation to 7 weeks is beneficial in treating small cell lung cancer. For Stage IV SCLC, recommendations will be similar to those for NSCLC. Small Cell Lung cancer can continue to travel to the brain despite aggressive chemotherapy and radiation. In fact, this happens so often that studies have shown a benefit to treating the brain with a low dose of radiation before any cells can grow into a tumor (prophylactic treatment). 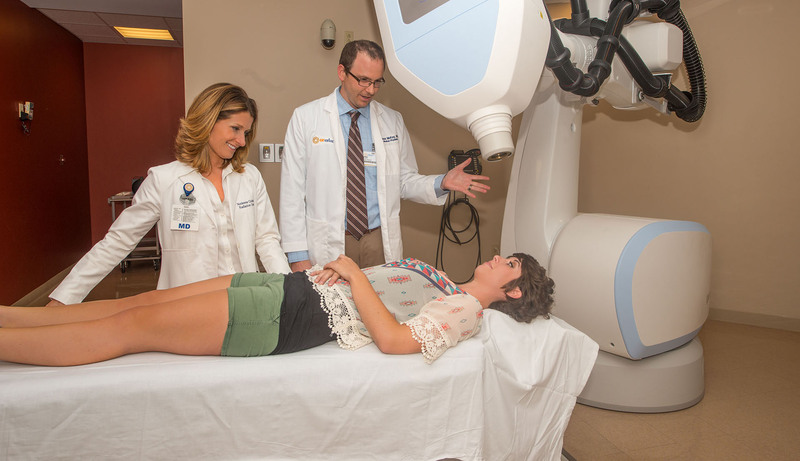 Your radiation oncologist will typically meet with you about a month after your lung treatment to check on you. Dr. Gullett assess her patients’ breathing and response to lung radiation and then orders a brain MRI to see if the cancer has had spread to the brain. She recommends you consider 10 radiation treatments to the whole brain to eradicate any microscopic tumor cells that may have persisted after chemotherapy. Radiation planning will start with an appointment for CT simulation. CT simulation is a planning session that involves several key components, including creation of an immobilization device and completion of a CT scan. For lung cancer, a special type of CT simulation is often done called a 4D CT simulation. The challenging in treating lung cancer with radiation is that the patient is breathing during the treatment. So the target, the tumor, is moving in all different directions. The way we handle this is to do a 4D CT which measures your breathing motion during the CT simulation. Prior to undergoing 4D CT simulation a belt will be placed around your chest. The therapist will ask you to breath in and out and the computer attached to the belt will record the motion of your chest during your breathing. We will use a composite of these images to plan your radiation so that we know where the tumor is located during your respiratory cycle and can target it accurately. THE RADIATION TREATMENT ITSELF IS PAINLESS. YOU WILL NOT FEEL THE RADIATION ENTERING OR LEAVING YOUR BODY. Treatment is around 15 minutes long. 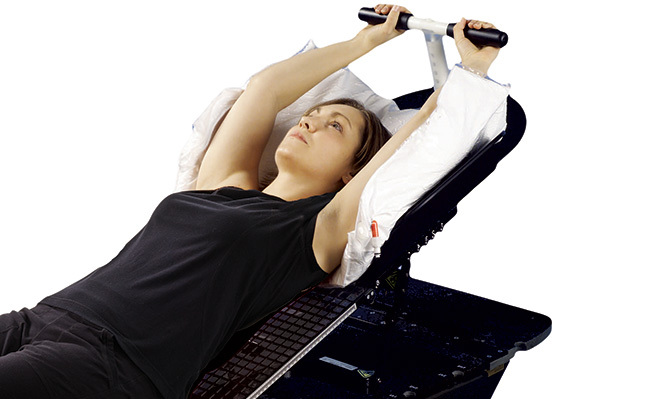 You may be positioned on your back, arms above your head in a cradle molded to your body.